Heilbronn, July 2016. – A Spanish worldwide operating automotive supplier already put the third ILLIG UAR 155g thermoformer in operation at the beginning of this year. Air ducts are manufactured on this machine in the twinsheet method out of cross-linked PE foams (XLPE). They are suitable for air-conditioning of vehicle interiors. The automotive supplier, domiciled in the North of Spain in the Basque province of Álava, is specialized in the production of seals and sound-reducing components made of foams. The extremely lightweight ducts for guiding hot and cold air, manufactured in the thermoforming method, meet the demands of the automotive sector especially well. Compared to blow-molded, hard PP ducts still frequently used they provide clear benefits thanks to their positive properties. In twinsheet thermoforming of XLPE foams two materials heated up to forming temperature are formed into half shells in the mold, supported by vacuum, and at the same time they are welded together on the outer contour. With the system developed by ILLIG; the formed parts are punched directly in the mold after the end of the cooling time. The upper mold part is equipped with extendible serrated knives. The lower mold part is equipped with grooves in which the knives immerse during punching. The punched out parts are held by holding bridges and moved out of the forming station in this way. Outside the thermoforming machine only the connection areas of the air ducts have to be cut – just like blow-molded hard ducts. A duct made of XLPE foam (density approx. 70 to 80 kg/m³, subject to application) is not only substantially more lightweight than a duct made of solid PP (density about 0.9 g/cm³ or 900 kg/m³), among other properties, it also possesses substantially lower heat conductivity and better acoustic dampening behavior thanks to its structure. In this way the foam’s lower heat conductivity and heat capacity minimizes development of condensation water in the air duct after switching off the air conditioning system. High elasticity and good resilience of the ducts provide further benefits, such as ease of assembly and reduction of squeaking and rattling sounds even with only smallest installation space available. For air duct thermoforming XLPE (thickness 3 to 4 mm) is supplied by two material roll stands and each material is heated up in the forming station to a surface temperature of max. 200 C. Subsequently the heater moves out of the forming station very fast – movement time less than 3 s – in order to minimize cooling of the material up to the start of the forming process. Consequently, the servo drives for the upper and lower mold table are designed especially for very fast movement speeds of up to 500 mm/s, even for molds with a weight of up to 1 t per mold table. 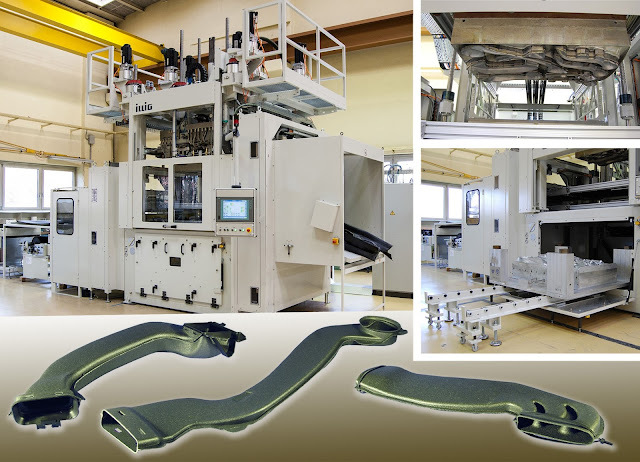 A further benefit provided by thermoforming with ILLIG technology compared to extrusion blow molding: Several parts of even different sizes and geometries can be manufactured at the same time on the large-area mold (the UAR 155g features a forming area of max. 1.450 mm x 1.200 mm). This means a short cycle time per air duct. Thus air ducts made of foam are competitive with PP blow-molded hard ducts also in terms of costs – manufacturing costs per duct are comparable.